I’ve been experimenting with low-carb, low-sugar baking, a challenge when most baking recipes call for sugar. 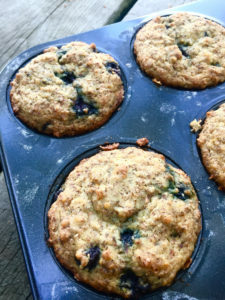 But these muffins turned out really moist and delicious…and were a great way to use the last of summer’s wild blueberries. Combine wet ingredients (except blueberries) in one bowl, and dry ingredients in another. Stir the wet into the dry, then carefully fold in the blueberries. Spoon into greased and floured 12-muffin pan. Bake in a 375 degree oven for about 17-20 minutes, until a wood toothpick comes out clean. Cool and enjoy.